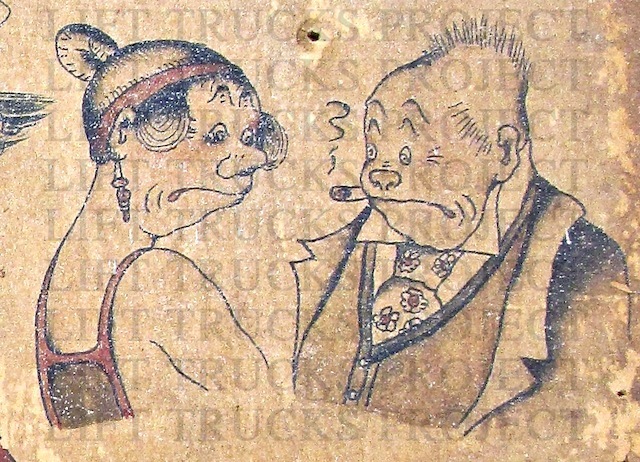 Tattoo artists often employed popular characters for sample art boards hanging in their atelier. In this drawing by Thomas Berg, this pair from the comics are tossed in the mix with traditional sailors imagery of flags, dragons and, of course, mom. The humor centers on an immigrant Irishman named Jiggs, a former hod carrier who came into wealth in the United States by winning a million dollars in a sweepstakes. Now nouveau-riche, he still longs to revert to his former working class habits and lifestyle. His constant attempts to sneak out with his old gang of boisterous, rough-edged pals, eat corned beef and cabbage (known regionally as "Jiggs dinner") and hang out at the local tavern were often thwarted by his formidable, social-climbing (and rolling-pin wielding) harridan of a wife, Maggie, their lovely young daughter, Nora and infrequently their lazy son Ethelbert later known as just Sonny. The strip deals with "lace-curtain Irish", with Maggie as the middle-class Irish American desiring assimilation into mainstream society in counterpoint to an older, more raffish "shanty Irish" sensibility represented by Jiggs. Her lofty goal—frustrated in nearly every strip—is to bring father (the lowbrow Jiggs) "up" to upper class standards, hence the title, Bringing Up Father. The occasional malapropisms and left-footed social blunders of these upward mobiles were gleefully lampooned in vaudeville, popular song, and formed the basis for Bringing Up Father. The strip presented multiple perceptions of Irish Catholic ethnics during the early 20th century. Through the character Jiggs, McManus gave voice to their anxieties and aspirations. Varied interpretations of McManus's work often highlight difficult issues of ethnicity and class, such as the conflicts over assimilation and social mobility that second- and third-generation immigrants confronted. McManus took a middle position, which aided ethnic readers in becoming accepted in American society without losing their identity. A cross-country tour that the characters took in September 1939 into 1940 gave the strip a big promotional boost and raised its profile in the cities they visited. Newer PostHere There Be Dragons.